Who wore what at the star-studded Mumbai Reception of Deepika & Ranveer - all the insider pics & deets! Deepika Padukone and Ranveer Singh have been grabbing headlines ever since they announced that they are going to tie the knot. The couple first tied the knot in two private ceremonies at Italy's Lake Como which was attended by only close friends and family. Post that, the newlywed first threw a wedding reception in Bangalore on November 21 and another one in Mumbai on November 28. Although, everyone was eagerly awaiting their Mumbai reception, owing to the mad party thrown by Ritika Bhavnani for the newly weds, expectations were more high. This one was attended by who’s who of Bollywood and by the way my Instagram is flooded right no, I ain’t complaining. It was every bit magical and stary as expected and Beyond! 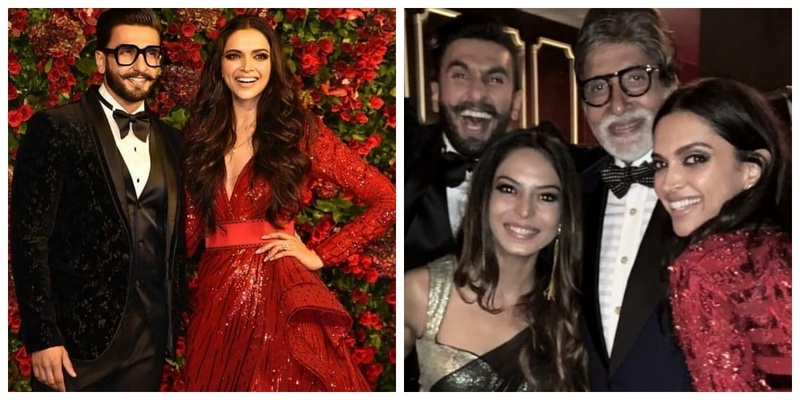 While Deepika looked ravishing in an embellished blood-red Zuhair Murad's gown with a long train, Ranveer looked dapper in a black tuxedo, styled by Rohit Gandhi and Rahul Khanna. Ranveer Singh’s Dad - Jagjit Singh, Sister - Ritika and Mom - Anju Bhavnani strike a pose. In love with Deepika’s retractable trail from the gown that turned into a dress. And I am more in ;love with change of footwear to sneakers. All, you brides to be take notes. If you wanna dance your night away, wear comfy shoes! Ranveer on the other hand changed into something only Ranveer can describe. But hey, the man does look handsome in anything he chooses to wear. Well well, with a party like that, I am really gonna take time to recover from!